This is an easy way to include exhibition catalogs or a PDF of your CV on your website. In the video I show you how upload and link to a doc, xls, pdf in WordPress using the reviews page of my fine art site as an example. Mainly I upload catalogues of exhibitions or reviews in the form of PDFs but you can also upload Word or Excel documents. you wish to have the file linked to. Above the text-editor window you should see a section with “Upload/Insert” as its heading. Browse and find the file on your local computer. Note It is recommended that you make your file name “server friendly” by making sure the file name has no spaces, apostrophes, slashes or other non-alphanumeric characters ($,%,&, etc.) and renaming the file before uploading if it does. 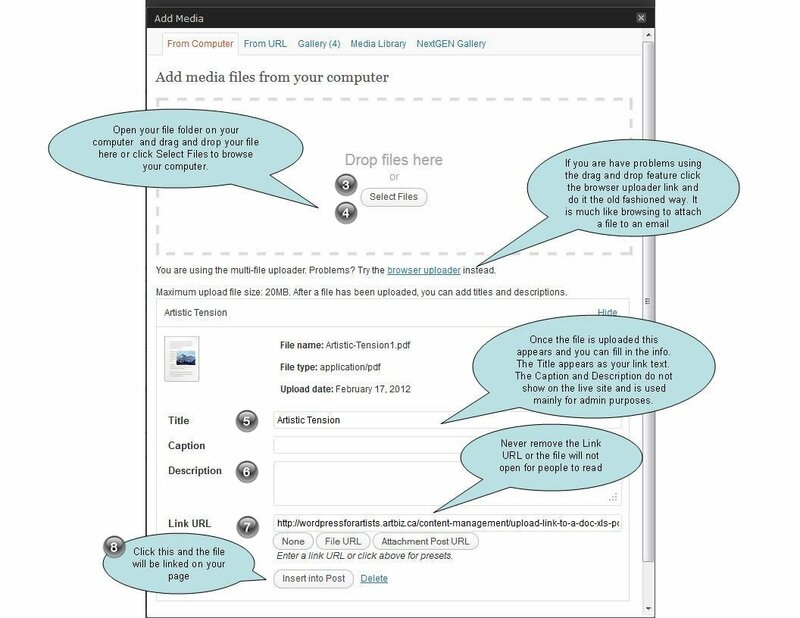 You can drag and drop the file into the upload area or browse your computer via the select file button. Once the file is finished crunching, a more detailed task pane will appear and the file name will now be filled in next to the “Title”. You can give the file any title that you want. It doesn’t have to be the file name. Under Title, type a short name for the file. Here’s an example PDF file that I linked to on this page – Artistic Tension (PDF) . If you do not type file name, the default will use the name of the file you uploaded. Captions are not used when inserting links to documents. Once the link has been created, open it with the hyperlink icon in the editor and add a Title for SEO. Under Description, type a slightly longer, more descriptive note about what the file is. This only appears in the Media Library for admin purposes and not on the site. Select the “Link URL” – in most cases this will be “File URL” – which will insert the link needed to the file you just uploaded to the server. Click “Insert into Post” – the dialog window will now close and you will see the linked title for your file. Update your page and preview your work. I am trying to post the invitation poster for my recent art show in Toronto right on my `art shows and events’ page but it only shows the link. It is called `Rangoli Art Show’. Can you show me how I can post the actual jpeg in the listing rather than just the link? I am not getting the option to upload or insert a file on my edit page, do you know why?